Guy Brothers Roofing - About Us Guy Brothers Roofing Contractors - Pensacola Roofing Company - Pensacola Roof Repair - Pensacola Roofing. They truly care about the service they provide from the moment you visit their website, call them, to when they arrive, to the completion of their work, and the follow up to see how things are going, they refuse to be second rate in their dedicated service. With the exception of severe weather or emergencies, they do everything they can to serve your needs timely. 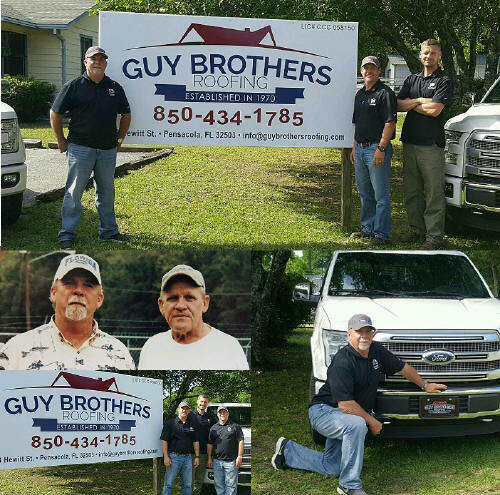 Guy Brothers Roofing team make sure your home or business and the area around it is always neat when they are through and their workers are respectful and polite. Guy Brothers Roofing cares about the local economy. They hire locally, and many of their employees have worked with them for many years. They care about their employees by making sure they are continually training them in safety with a comprehensive safety plan and program. They offer them benefits that help them and their families. In appreciation of their customers, local communities, first responders and military, they donate our energy, resources and finances to those in need in the local community and local military and first responders. They offer military discounts and often match those of their vendors as a way of saying thanks.